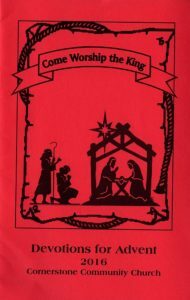 Each year the family and friends of Cornerstone Community Church write and publish an Advent devotional. 40 or so folks sign up to write, then are assigned a passage to pray over. Eventually they will write 250 - 300 words about the impact of the message of the passage they've been assigned. Their work is laid out in a daily devotional format, printed, bound in a bright red cover, and given away in our community, to our families, and to visitors who have joined us over the course of the previous year from all around the globe. Each year has a unique theme. In 2016, it was "Come Worship the King." 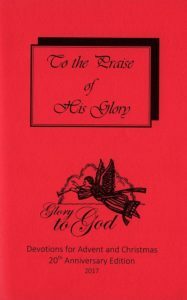 In 2017, our 20th anniversary edition, it was "Glory to God." For 2018 the theme is "Immanuel, God With Us." 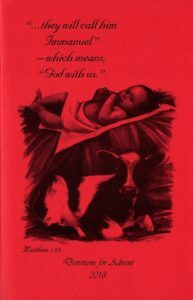 Click on the cover picture icons below to be taken to a PDF of that year's devotional.